My Rackspace colleague, James Thorne, has a post on his extremely useful blog that uses the 4.2.1 release of the Rackspace Private Cloud (RPC) to install the Havana release of OpenStack on a laptop using Vagrant and Chef. Since James’ post actually uses the GA version of RPC and includes Neutron Networking, I highly recommend that readers use the instruction in his post instead. Not long ago, I posted an article outlining how you could install a HA OpenStack environment on your laptop or workstation, using Vagrant with a virtualization tool, such as VirtualBox, VMware Workstation, or VMware Fusion. That post borrowed heavily from another post by my Rackspace colleague, James Thorne and was designed to allow someone to get up and running quickly on OpenStack for testing and demonstrating high-availability. 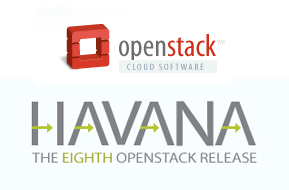 Since then, a new release of OpenStack, code-named Havana, has been released, with some important new features. In this post, I’ll walk through installing OpenStack (Havana) on a laptop using Vagrant with VirtualBox, Workstation, or Fusion; this deployment should be suitable for testing and demos. However, instead of deploying a pair of HA Controllers, I’ll provide instructions on deploying a single controller but throw in a Cinder Volume node as a bonus. Also, instead of having you “flip” back and through between mine and James’ blog, I’ll put the bulk of the instructions and commands into this post; however, I am borrowing heavily from James and the great work he has put into his blog. We will be using Opscode’s Chef to deploy an early access release of the Rackspace Private Cloud (RPC), version 4.2. RPC 4.2 is a beta product that is based on the downstream Havana trunk. So although Rackspace has changed the Horizon dashboard skin to show the RPC logo, the underlying code is 100% OpenStack trunk. Because Rackspace is not currently supporting the Heat project in its early access release of RPC, Heat is not included in the generic install. However, in the post, I will walk you through how to add Heat to your deployment. Swift object storage is not part of this install. I’ll update this post or writeup a new post on how to install Swift when I’ve had more time to potentially work on an entire blog series on the Swift project. While Neutron Networking is part of RPC 4.2 and the recommended networking project to use in production, I am going to walk though the old-style Nova Networking in this post. 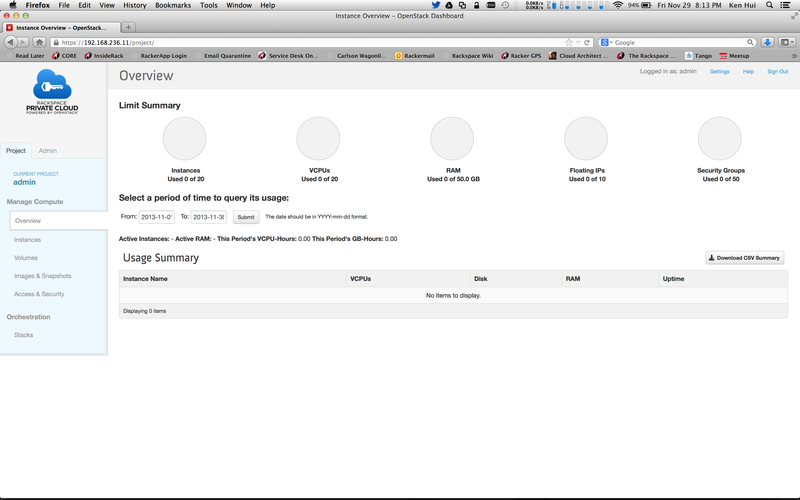 I am primarily doing this because of some issues I am having getting Neutron to work with my particular setup; I expect to update this post as soon as I have those issues worked out. My thought is to get this post out there so folks can start playing with other aspects of OpenStack, like the new dashboard in Havana, Heat, Ceilometer, Cinder, etc.. Since RPC 4.2 is an early access release, Rackspace does not provide support for the product; again, think of it as a beta product. Full support will be available next month when RPC 4.2.1 is generally available. 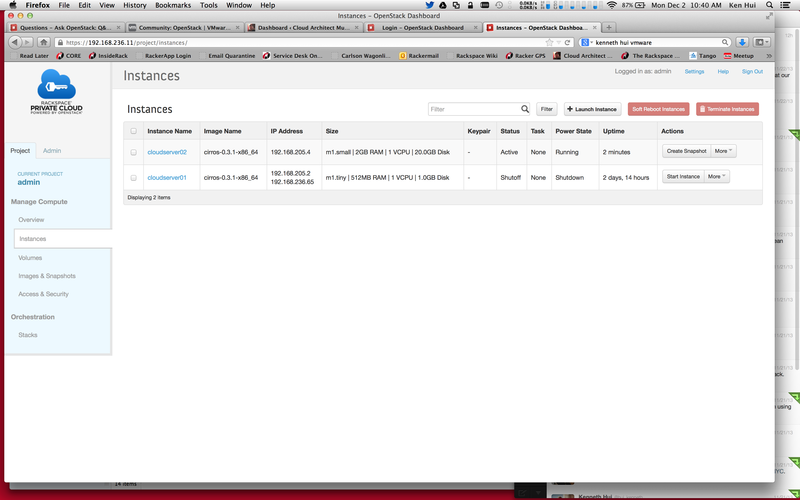 So what are we building on your laptop or PC to test OpenStack? The sample Rackspace Private Cloud reference architecture below shows the 5 node environment we will be creating, with 1 Chef server node, 1 Controller node, 2 Nova Compute nodes, and 1 Cinder node. 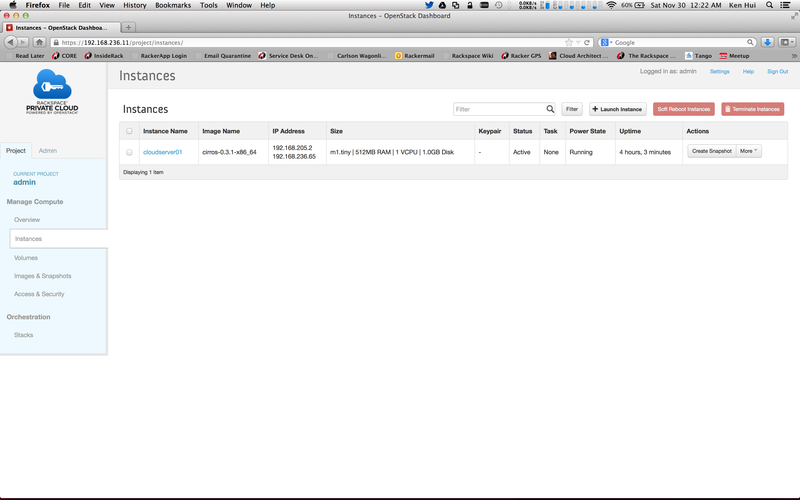 Note that most OpenStack services will run on our Controller node. 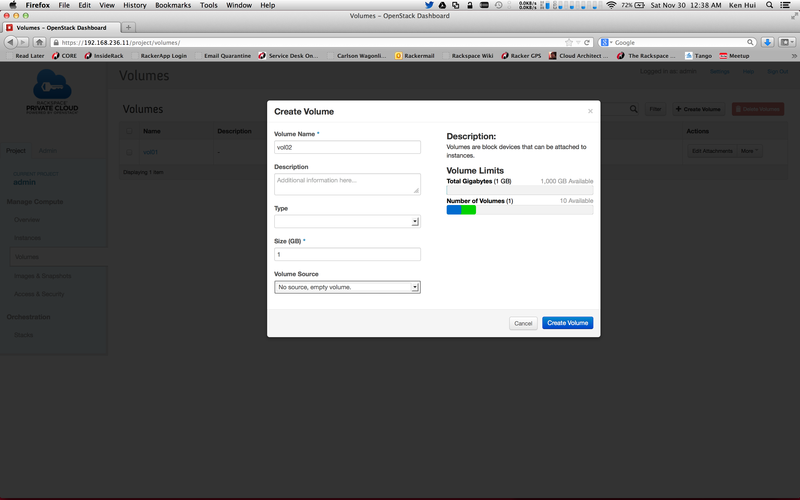 The first step is to install Vagrant; I recommend using version 1.3.4 or later. Then install whichever virtualization software (VirtualBox, VMware Fusion, VMware Workstation) you intend to use as your Vagrant provider, including any Vagrant plugin that is required. Create a password-less SSH Public/Private key, hitting enter to accept all defaults. ssh to each of your OpenStack nodes and log on as root (I prefer doing so from the chef node since that logs me on as root automatically). Once you’ve gone through all the nodes, RPC 4.2 (powered by OpenStack Havana) should be up and running on your laptop/workstation. The following steps will configure a 4 GB test loopfile that you can use for Cinder block storage services. You can find more details in the OpenStack Block Storage Service Administration Guide. 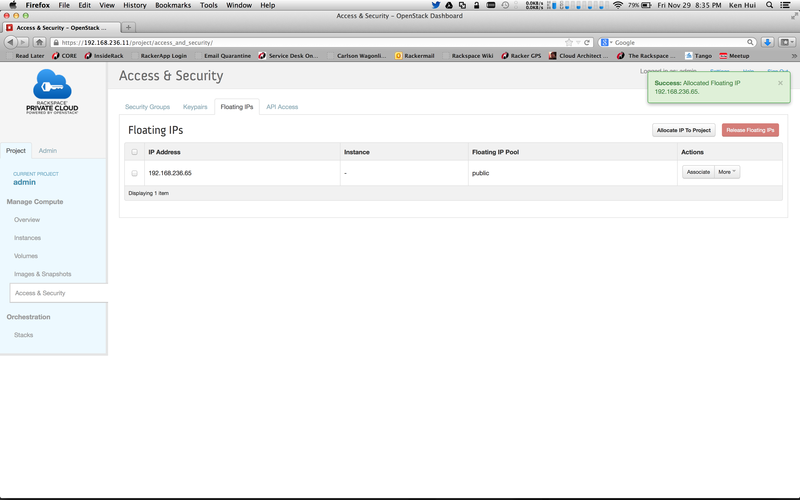 Before logging on to the Horizon dashboard to play around or to perform a demo, let’s do some initial configuration. Time to spin up your first Cloud instance and attach a persistent block volume to it. 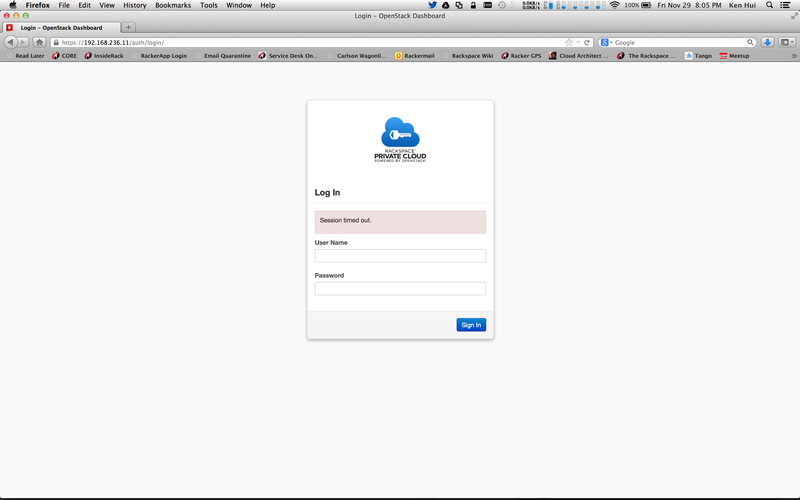 Log in as the Cloud Administrator using User Name: Admin and Password: secrete. 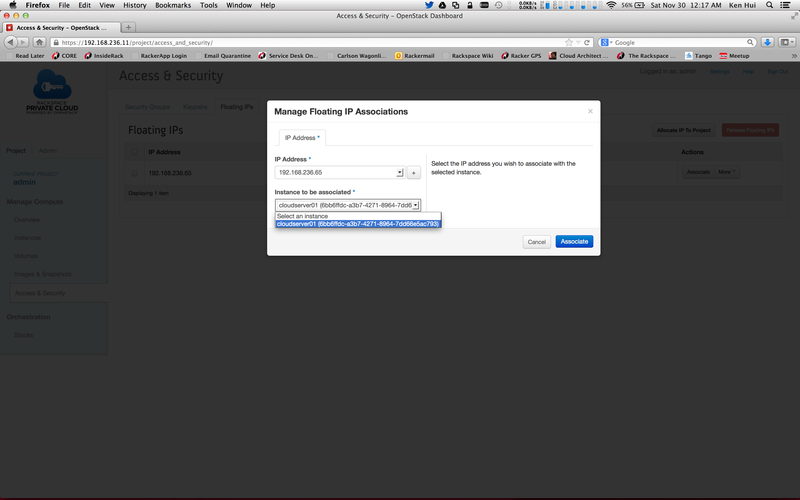 Assign a floating IP address to your instance by going to “Access & Security” and choosing the “Floating IPs” section. 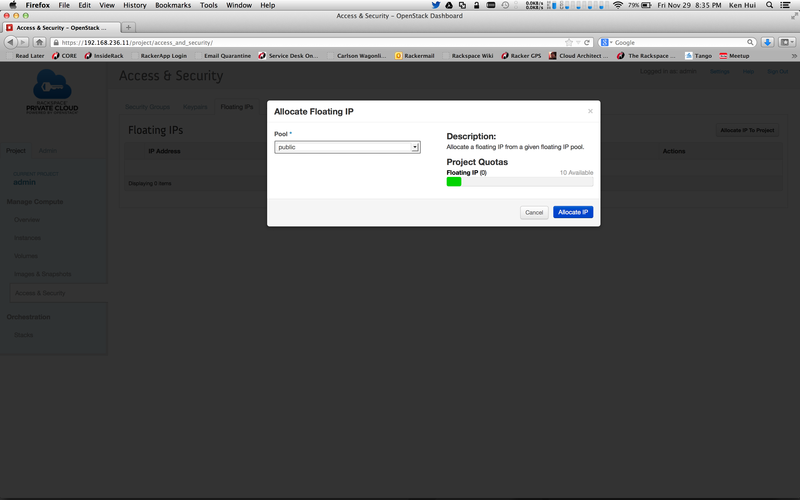 Click on the “Allocate IP To Project” button and from the dialog box, allocate an IP from the public floating pool you created earlier. You now have an environment to play with and to demo OpenStack on your laptop or workstation. For more information on how to configure and to use OpenStack, I recommend looking at the Documentation sections of the OpenStack Foundation website and the Rackspace Private Cloud Knowledge Center. To dive deeper into configuring OpenStack with Chef and vagrant, I recommend perusing the Professional OpenStack website and also purchasing the “OpenStack Cloud Computing Cookbook” by my colleagues, Cody Bunch and Kevin Jackson. I don’t reblog as often but this is flat out cool and needs as much exposure as possible. Thanks Ken! I’m elaborating the error I have reported. Please find detailed error below. Please note I’m using I’m trying this on 32bit laptop. 15: # WITHOUT WARRANTIES OR CONDITIONS OF ANY KIND, either express or implied. 17: # limitations under the License. Yes, I am seeing the same thing. I’ll troubleshoot this Thursday morning. Any luck khui? Thanks in advance. Yes, looks like it’s a WordPress issue. WordPress is not properly formatting single quotes or double dashes. For the “knife bootstrap” and “knife node run_list add” commands, please type the commands out instead of doing a copy and paste. Looks like it’s a WordPress issue. WordPress is not properly formatting single quotes or double dashes. For the “knife bootstrap” and “knife node run_list add” commands, please type the commands out instead of doing a copy and paste. I tried again. No Luck. I faced same issue. I remember single quote in knife command was changed to a comma when I did for first time. Command did not work so I changed it back to single quote then command worked. This don’t seems to be issue. DSL recipe is the issue. Need to tell this to Chef guys. I don’t saw any other reporting this. On opscode I found this recipe docs etc., but no issues. Looks like the issue is that the dsh and some other recipes involved need Chef 11. Which is cool, except some versions of vagrant force the 1.8.7 ruby and the associated chef 10.0.4 gems. 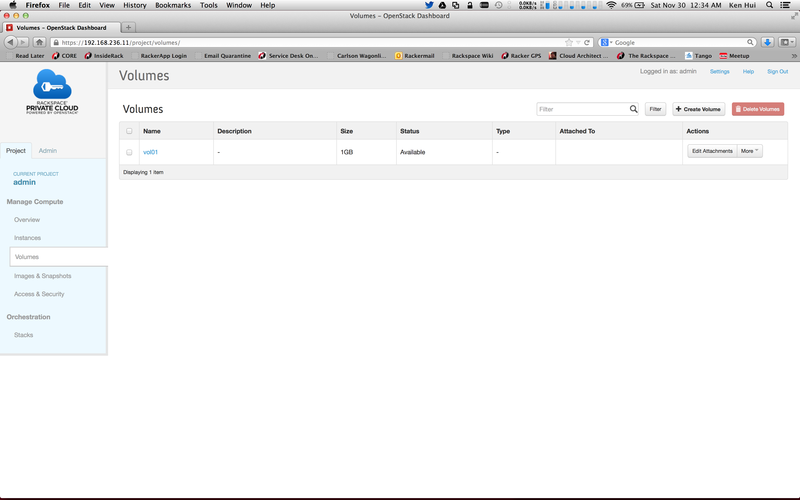 So, when you go to knife bootstrap it installs the old version of chef that doesn’t support dsh. into root@chef:/root/.chef/knife.rb before the bootstrap. Or just pulling the chef deb from opscode.com. That is correct. The recipes we use for RPC are based on Chef 11.04. Thanks for the workaround. Q chef_11.0.0-1.debian.6.0.5_i386.deb this chef server works? I mean is this 11.04 as needed? Q what should I do after dpkg or before dpkg to install and configure chef/knife? Thanks in advance, WEnd screwed still struggling. Please help! OpenStack is only supported officially on 64-bit Linux. controller If your chef_server_url is correct, your network could be down. if i change it in the knife.rb on the node, it will connect ok, but it gets set back to the other IP when the bootstrap is run. Now I’m trying this on a 64bit Ubuntu blade. Struck in same stage like you. I wonder after successful installation also there no chef-server service. Its ngnix. 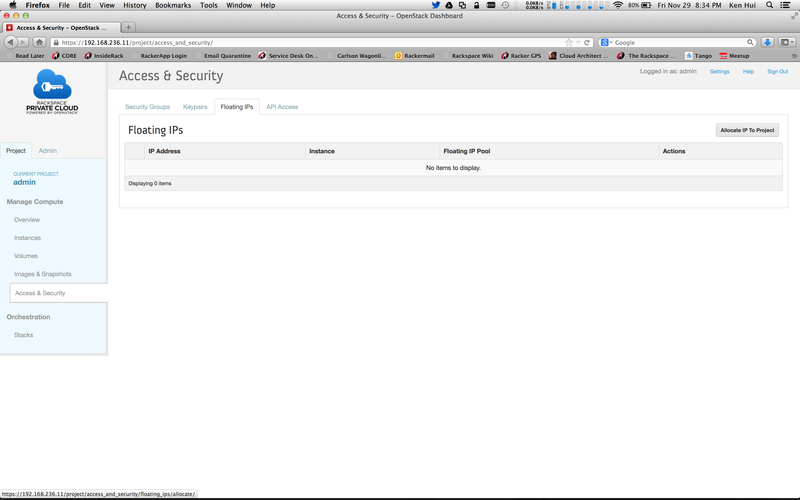 Some how I could able to knife configure and create client. 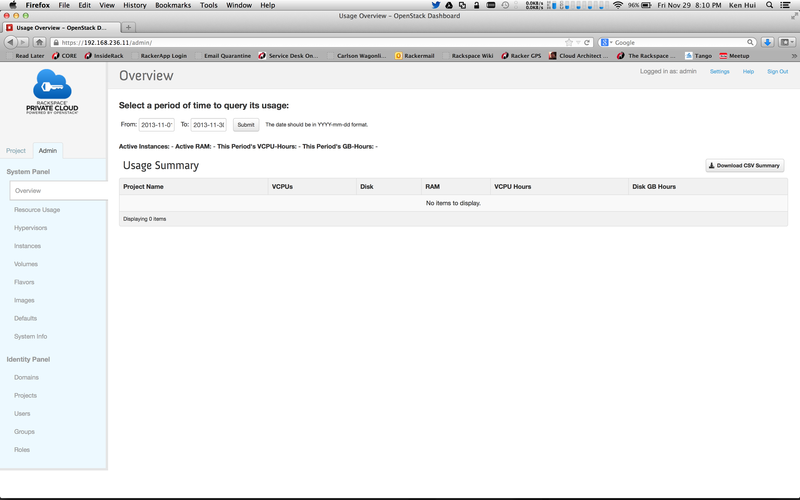 But now struck with uploading cookbooks. ngnix is used as webserver or any thing wrong with my install? I had the same problem. In my first run, I copied the command and replaced the dashes – that failed with the error. After that I wrote the command by hand and it works successfully. 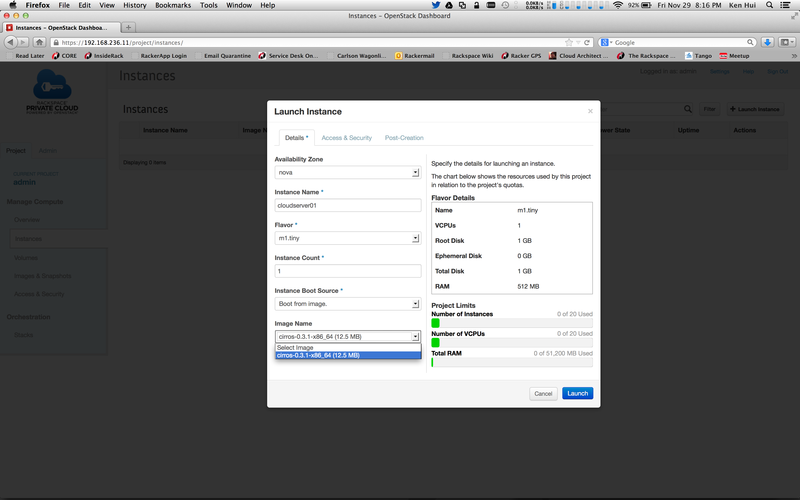 “Go to “Instances” and lick “Launch Instance.” ” :). Excellent article though. I encountered “ERROR: Can’t find network management”, following hints from https://community.rackspace.com/products/f/45/t/1514 , I ran “chef-client -E rpcv420” instead of “chef-client” and it worked. Is this due to the validator key being in the wrong place or something? I also changed my /etc/chef-server/chef-server.rb file. I tried the fixes suggested by Joe H (https://tickets.opscode.com/browse/CHEF-4069), but that didn’t work either. Was there a final fix for this? Just a +1 from me: I’m also pretty new and am likewise stuck with the connection refused error on the clients. My CHEF_SERVER_URL is set to https://chef:443 but it’s somehow taking the IP address from somewhere instead. Any ideas on the correct fix? controller Creating a new client identity for controller using the validator key. Sorry I haven’t had a chance to check on this. I will take a look over the weekend to see what the issue may be. Thank you for your patience. 1. controller does not know the NAT IP, Therefore, you will have to setup port forwarding from controller node to talk with NAT. 3. incorrect chef-server-url in .chef/knife.rb, so make sure hostname is used in the chef server url. I posted an update to this post recommending that folks use the instructions on my colleague, James Thorne’s blog at http://goo.gl/kPhxeI since it uses the GA version of RPC and includes Neutron networking. It should also alleviate some of the issues that folks have been seeing. I “fixed” hacked the chef_server_url in the install script with the following. Decided to start from scratch when I found this but a vagrant destroy makes that easy. I also specifically had to add the roll[“heat-all”] AFTER roll[“keystone”] in the single-controller role. Thanks so much! I got it up and running, and it is pretty awesome. Then, I ran `chef-server-ctl reconfigure` on the chef node to put the changes into effect before running chef-client on the nodes. This code updated hostname instead of IP address which reduced occurance of errors pertaining to hostname entry. 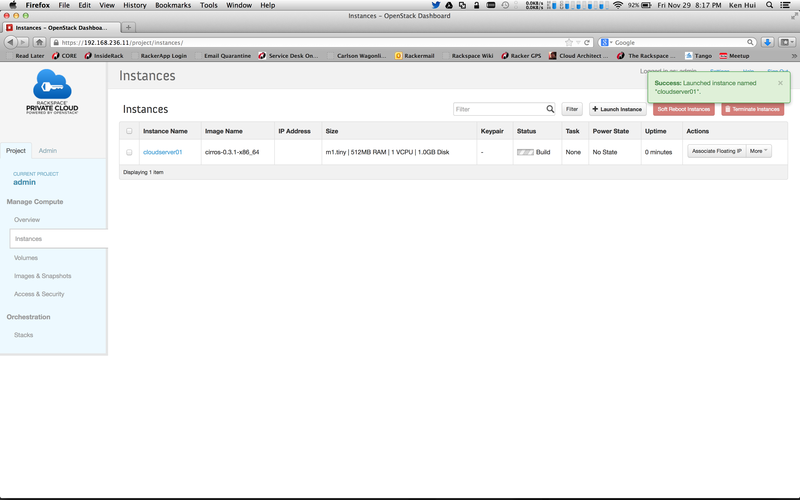 3) when I am executing chef-client in controller node, I am getting the “can’t find network management” error. I managed to install chef-client with Environment option (E) as mentioned by pellaeon. Thank you, pellaeon for your direction in this thread. New release ‘14.04.2 LTS’ available. 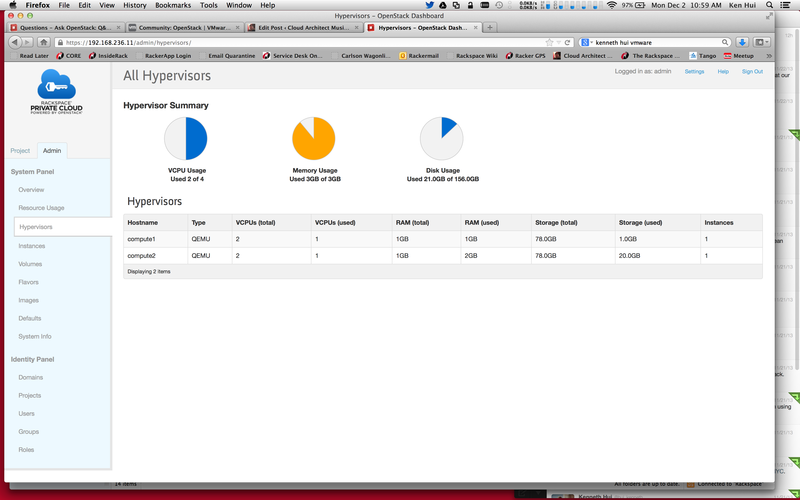 It could be a stupid question: what is the hypervisor that manage my instances in that virtualized architecture? I used vbox so i can virtualize every single node on my laptop, but what is the hypervisor on a single node that manage the instances dispatched by rackspace? is precise64 a kvm image? It should be QEMU since you are leveraging nested VMs. ty kenhui! I thought it yesternday reading RPC Sandbox docs, but i wasn’t sure if it is the same thing. Ty for your precious comment!! !